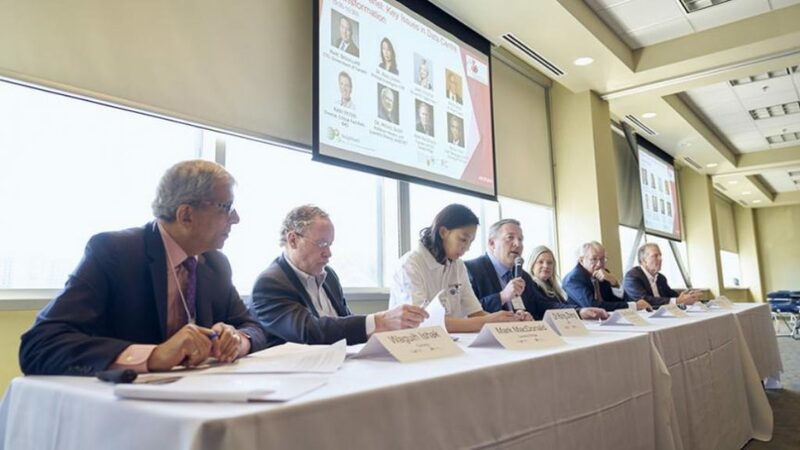 On June 14, the Computing Infrastructure Research Centre (CIRC), in partnership with McMaster Engineering and InsightaaS, hosted The Great Canadian Data Centre Symposium, Canada’s first event on data transformation and innovation. The symposium, which took place at McMaster Innovation Park, brought together 290 data centre operators, suppliers, academics and industry from across Canada to discuss key issues in data centre transformation with expert panels and speakers. As the only resource centre for data centre research and development in North America, the CIRC is helping to build Hamilton’s reputation as a central hub for tech innovation. Representatives from Hamilton tech start-ups such as Cinnos Mission Critical were also in attendance. Cinnos is centred on their “data centre in a box” invention, a scalable, energy-efficient data appliance that can be quickly and affordably deployed. Cinnos is one of many start-ups bringing more jobs to Hamilton. Waguih Ishak, electrical engineering McMaster alumnus and recent recipient of an honorary Doctor of Science at the Faculty of Engineering’s Spring convocation, was part of a panel discussion at the event. Ishwak is an international leader in optics and photonics research and division vice president and chief technologist at Corning Inc. in Silicon Valley. Rong Zheng, associate professor with McMaster’s Department of Computing and Software and a principle investigator at the CIRC, is working towards solutions with her research team. Zheng, another panellist at the event, discussed how her and her research team are working on software tools, data centre design and management to make data centres more resilient. On June 14, the Computing Infrastructure Research Centre (CIRC), in partnership with McMaster Engineering and InsightaaS, hosted The Great Canadian Data Centre Symposium, Canada's first event on data transformation and innovation. 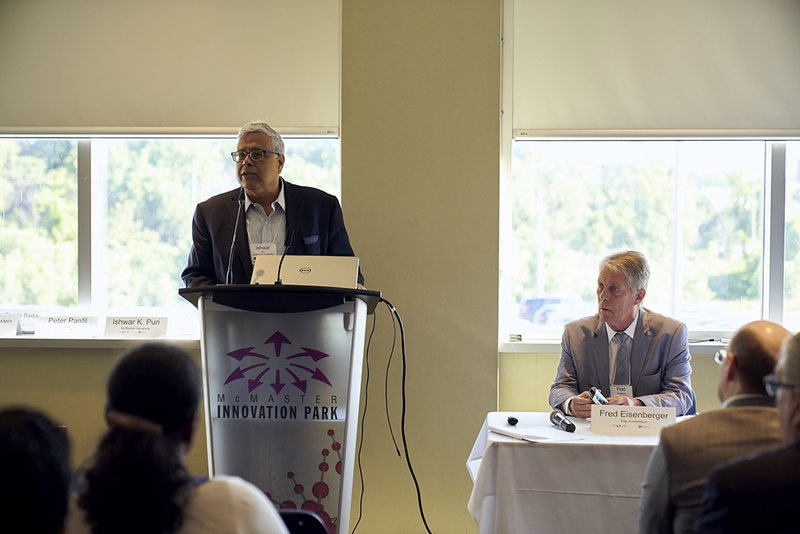 The symposium, which took place at McMaster Innovation Park, brought together 290 data centre operators, suppliers, academics and industry from across Canada to discuss key issues in data centre transformation with expert panels and speakers. “Our world increasingly depends on digital connections that move data,” said Ishwar Puri, Dean of the Faculty of Engineering and CIRC founding academic director. “Entertainment, government forms, flight tracking, weather information, news and social media are just some examples.” <img src="https://www.eng.mcmaster.ca/sites/default/files/uploads/datasymposium2.jpg" width="600" height="400" /> “Today’s data centres use electricity inefficiently and are ripe for disruption,” said Puri. “The symposium has demonstrated the CIRC’s influence in enabling new and disruptive technologies that hold value for manufacturers, data centre operators, businesses and consumers, who all want data access immediately.” As the only resource centre for data centre research and development in North America, the CIRC is helping to build Hamilton’s reputation as a central hub for tech innovation. City of Hamilton Mayor, Fred Eisenburger, who made opening remarks at the event, talked about his strong support of “pushing broadband and digital capacity to improve citizens’ lives.” Representatives from Hamilton tech start-ups such as Cinnos Mission Critical were also in attendance. Cinnos is centred on their “data centre in a box” invention, a scalable, energy-efficient data appliance that can be quickly and affordably deployed. Cinnos is one of many start-ups bringing more jobs to Hamilton. Waguih Ishak, electrical engineering McMaster alumnus and recent recipient of an honorary Doctor of Science at the Faculty of Engineering’s Spring convocation, was part of a panel discussion at the event. Ishwak is an international leader in optics and photonics research and division vice president and chief technologist at Corning Inc. in Silicon Valley. “Every human is generating about a megabit of data per second," said Ishak. “If this continues, we need another solution for big data centres.” Rong Zheng, associate professor with McMaster’s Department of Computing and Software and a principle investigator at the CIRC, is working towards solutions with her research team. Zheng, another panellist at the event, discussed how her and her research team are working on software tools, data centre design and management to make data centres more resilient.